Sausage. Did you know it is almost a ubiquitous food? Every continent and the regions within have their own characteristic sausages. What makes them distinct is that they use meats and other ingredients native to the areas in which they are made. My sun-dried tomato sausage recipe is an adaptation of a few recipes “out there.” To bolster my blather I thought I would go looking for its origins. Guess what? I couldn’t find any references! It doesn’t seem to be a regional sausage at all. Therefore one can probably safely assume that it is a recent invention. This is Step 1: Process the sun-dried tomatoes with the cheese until it is crumbly. Regardless, this sausage meat can be combined in many Italian style dishes such as risotto, with pasta or stuffed with ricotta in manicotti. Sun-dried tomato sausage is made from pork, but I have seen enough precedents for you to 50/50 the pork with ground chicken or turkey – or perhaps even substitute entirely. Just remember, no fat in a sausage means a dry sausage. There’s little worse than a dry as cardboard sausage. 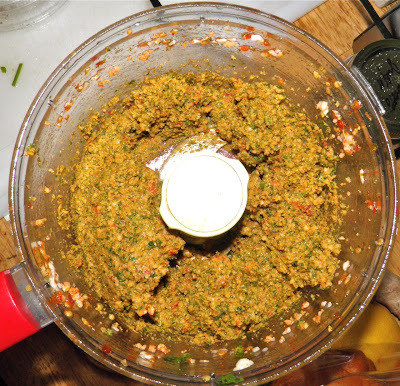 If substituting a lower fat meat, grind some fatty bacon or similar in with the poultry. 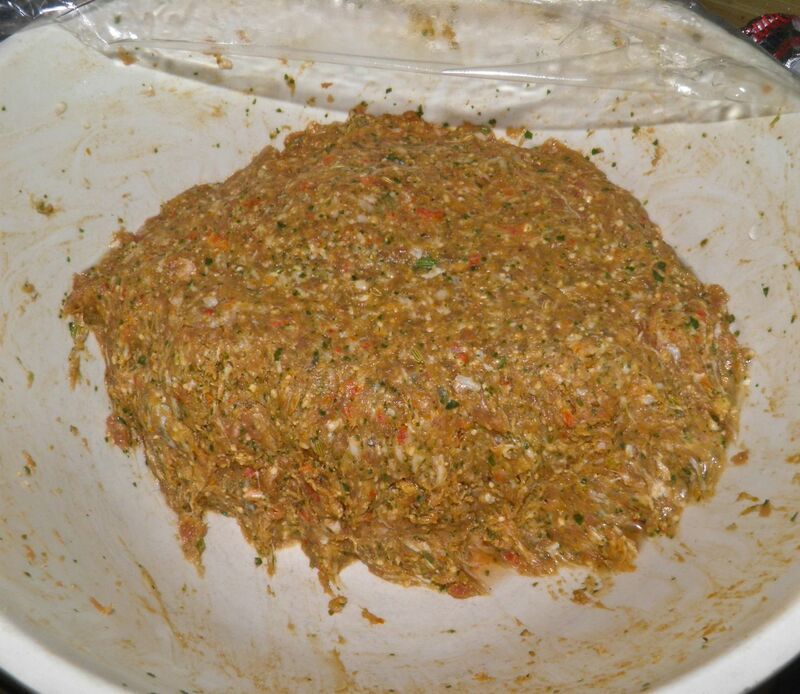 Step 2: Add in the (considerable) amount of Italian parsley and process until fairly paste-like. 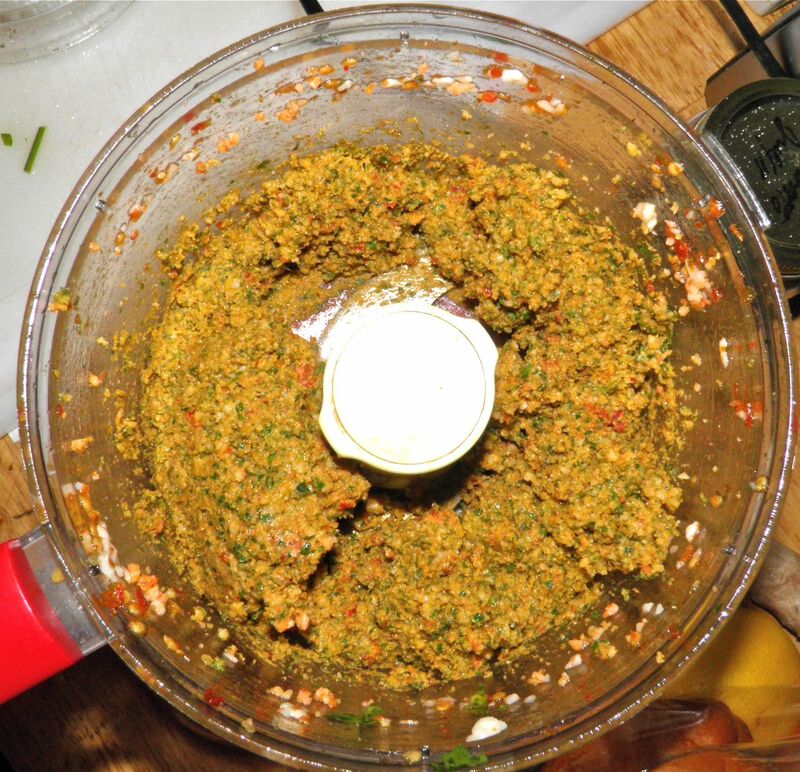 This mixture goes in with the rest of the ingredients. Sausage is a logical outcome of efficient butchery. 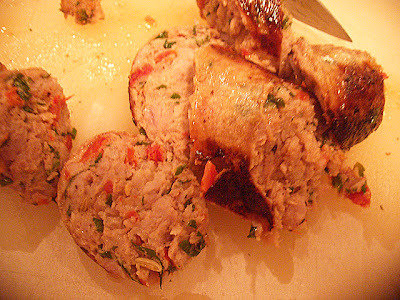 Traditionally, sausage makers put to use tissues and organs which are edible and nutritious, but not particularly appealing – such as scraps, organ meats, blood, and fat – in a form that allows for preservation: typically, salted and stuffed into a tubular casing made from the cleaned intestine of the animal, producing the characteristic cylindrical shape. Hence, sausages, puddings, and salami are among the oldest of prepared foods, whether cooked and eaten immediately or dried to varying degrees. Just so you know, you can now purchase casings that are not made from intestines. So the “yuck” factor is reduced. I will be combining some of this sausage meat as meatballs with sautéed artichoke hearts and onions with pasta tossed with pesto. I’ll post it soon so you can see what it’s like. 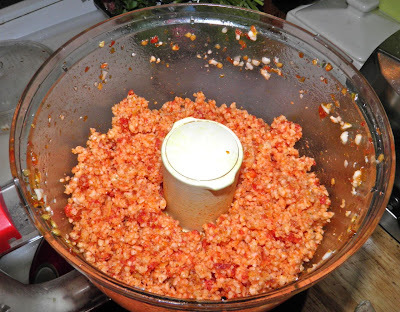 Place the sun-dried tomato/cheese paste in a bowl and add the remaining ingredients. Knead with your hands until very well combined. If you wish add the white wine. Fry a tiny piece and taste for seasonings. Adjust if desired. Place in the refrigerator for a few hours to let the flavours blend. Stuff into casings. Then tie off sausage into 5-6 inch links. Alternatively, form into patties for delicious pork burgers or make into meatballs to use with pasta.